The Ritz-Carlton Yacht Collection will evolve to encompass three purpose-built luxury yachts, the first of which will set sail in February 2020. The ship is being built in Spain, and will be a 624-foot-long yacht measuring 26,500 gross tons with 149 all-balcony suites to accommodate 298 passengers. The next two yachts will debut in early 2021 and 2022, respectively. The onboard vibe is dedicated to "modern luxury," something that Ritz-Carlton has defined and refined over the years, and considers to be excellent personalized service combined with authentic experiences that eschew any stuffy or phony sentiment. The brand wants passengers to expect the same friendly, intuitive service as they would at a land-based Ritz-Carlton hotel or resort. Cruise fares are all-inclusive with alcohol (throughout the ship and in your suite's mini-bar), gratuities and Wi-Fi included. Ritz-Carlton's first-generation, 298-passenger yacht will offer all-balcony suites, top-notch service, immersive activities on the ship and ashore, fine dining and high-end spa services. With decades of experience designing boutique-style lodgings, the Ritz-Carlton Yacht Collection is in a solid position to create a truly unique and beautiful yacht. The company, in concert with cruise industry veteran Tillberg Design of Sweden, is drafting elegant interiors and public spaces throughout the ship that will rely on pleasant earth tones accented by pops of crisp colors. Likewise, the line is developing an interesting array of onboard dining venues. Despite being small, yacht-like vessels, each will offer five different dining options, including a main dining room, poolside grill, a casual restaurant and 24/7 room service. The fifth culinary vision is Aqua, a Michelin-starred restaurant at The Ritz-Carlton, Wolfsburg, that's helmed by Chef Sven Elverfeld. There are six cabin categories and all include a "terrace" (what Ritz-Carlton calls a balcony). Beds are queen-sized with high-end linens that were exclusively designed for The Ritz-Carlton Yacht Collection. Every suite has an espresso machine with complimentary coffee and tea, plus a fully stocked mini-bar. On embarkation day, select from a gratis bottle of Champagne or wine. Wi-Fi is free to all cruisers. Bathrooms are outfitted with a double vanity and luxury bath amenities. The focus of the onboard experience is enjoying casual conversation and luxuriating in the ship's pools, whirlpools and spa treatment rooms. An aft water sports marina will be the focal point for daytime activities when the ship is at anchor. This won't be the line for you if you love a lot of nighttime activities. Entertainment will be low-key. (Think visiting local performers as well as in-house classical and jazz musicians.) There's no casino or theater presenting Broadway musicals. However, the cruise line will offer fully immersive cultural experiences by way of partnerships with local arts and music communities as well as renowned experts and lecturers. Onshore, you can explore independently or select one of five types of excursions on offer: Iconic Sights, Stirring the Senses, Cultural Connections, Active Explorations and Epicurean Experiences. Look to the Concierge Ashore program if you'd like the cruise line to customize a tour just for you. The first ship will be deployed in the Caribbean, Mediterranean, Northern Europe, and Canada and New England. Itineraries range from seven to 10 days. When the second yacht is ready for passengers, it will likely sail the St. Lawrence and the Great Lakes. The third yacht is expected to sail the Pacific. 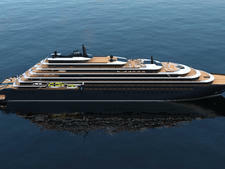 Travelers that are loyal to the Ritz-Carlton brand on land will likely be a core component of passengers aboard Ritz-Carlton Yacht Collection's first yacht when it debuts in early 2020. Through market research, the company discovered that many of its hotel and resort guests are also cruise enthusiasts who are interested in exploring a different dimension of oceangoing travel: the yachting experience. Passengers are likely to be educated, well-traveled North Americans who have previously cruised with a luxury brand. However, first-time cruisers who were never intrigued by mass-market mega-ships may gravitate to the Ritz-Carlton's intimate and custom cruise itineraries that cover small, out-of-the-way ports and destinations. The company also believes it will draw a younger demographic than other luxury cruise brands. Families -- with children 6 months or older -- are welcome onboard. There is a dedicated Ritz-Kids educational kids club. Expect enhanced family-centric services during school holidays and the summer months. Three new-builds will be the base of operations for the Ritz-Carlton Yacht Collection. The first ship will be registered in Malta and is under construction at the Astillero Hijos de J. Barreras shipyard in Vigo, Spain. While many details haven't been announced publicly, it's estimated that each ship in the fleet will cost approximately $210 million to build. Each 26,500-gross-ton, 624-foot-long yacht will feature 149 all-balcony suites to accommodate 298 passengers with 246 officers and crew onboard. The first ship debuts in February 2020, with the second and third ships on schedule for early 2021 and 2022, respectively.